Spring is here, and while we'd love to spend all of our time outside playing, the reality is- we have a LOT of rainy days around here! In fact, as I type this I look outside and see a rainy, dreary sky and rain falling down, keeping us inside once again- much as it has all week long. Telling the ultimate tale of a loveable underdog who proves anything is possible with determination and a posse of loyal lemmings, Norm of the North features the voices of Rob Schneider (Grown Ups), Heather Graham (The Hangover franchise), Ken Jeong (The Hangover franchise), Colm Meaney (Con Air), Loretta Devine (TV’s “Grey’s Anatomy”), Gabriel Iglesias (Magic Mike), Michael McElhatton (HBO’s “Game of Thrones”) and Bill Nighy (Love Actually). Now, if you've ready any reviews on this movie already, you may have seen that the reviews are...well, they're not so good! Many will tell you the story line was lacking or that it's a mish mash of aspects from other kid films rolled into one. I will be honest, it may not be as fast paced or exciting as other kids' movies on the market... but still, my kids loved it!! Immediately when our review copy arrived they had to pop it in and start watching. After they'd watched it once, they had to go back and watch it again! So, don't let those reviews scare you! It may not be winning any awards or winning over the adult critics, but the kids enjoyed it and at the end of the day, isn't that the most important thing? It's a good clean movie (aside from a reference to twerking) that you can feel pretty confident in allowing your children to watch that features a great message about stepping out of your comfort zone and fighting for what you believe in. 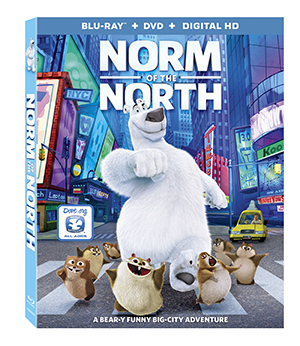 If you're looking for a movie for those rainy days inside, Norm of the North is a fun choice! It is available to purchase now on Bluray and DVD. Omgosh my son loves this movie too!! I think its adorable and I love his dance!! Plus yay for environmentally conscious movies!! Great lesson to pass on to our kiddos! This looks like a fun movie to watch. I like the animation. My Granddaughter would like this movie.